One of the key roles of education is to capacitate students with the necessary knowledge to apply it to address real-world problems. This is highly relevant in a country like Thailand, where education has historically not prioritized critical thinking and problem-solving skills. In the latest PISA results, Thailand ranked 55th out of 70 countries, with performance in reading and sciences severely declining since 2012 and math scores also falling. 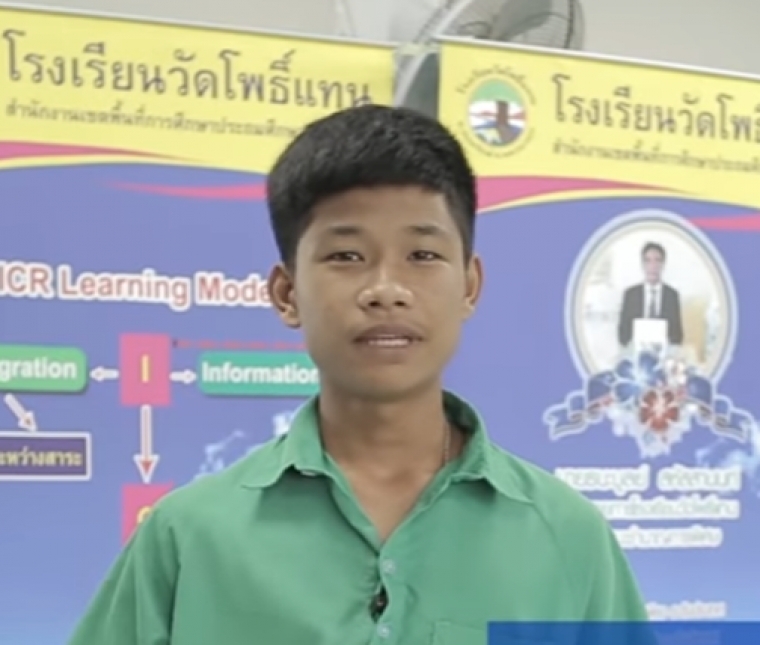 Resources are often limited and unevenly distributed, for example in the case of Wat Phothaen School in Nakhon Nayok and Kenan’s student success story, Nuttawut Hoyhuan. Boeing has worked with Kenan since 2009 to promote technology-driven education that recognizes the limited and under-utilized ICT resources available to many of Thailand’s schools. In 2016, emphasis was placed on technology to reinforce project-based learning in schools. Wat Phothaen School in Nakhon Nayok was one of the 21 nominated schools. As with most schools in Thailand, Wat Phothaen has its own set of challenges based on the geographical and cultural set-up of the land and its people, and the school struggles relative to those in large towns. The school has a low entry barrier and accepts a range of pupils. Though most students would prefer to go a large town school, their circumstances prevent this from being possible. Moreover, many of the students rely solely on the school for their education, as they come from first-generation education families. The school represents an opportunity to escape the poverty trap and create a better life. Project-based learning and technology in schools nurtures first-generation students and enhances their problem-solving and critical thinking skills. One of the students at the school used project-based learning to create a product that addressed a need in his community. “We developed a frog trap, to support my family’s fishing business. The frogs are used as bait to catch large fishes, like the snakehead variety” said Nuttawut Hoyhuan, the student head of the project, “A bottle can hold up to 50 grass frogs”. Nakhon Nayok is a large fishing area, so the product has a practical purpose, though small, it gave Nuttawut Hoyhuan the confidence that he can create something that makes a difference. The idea was not successful at the first time attempt but after experimenting with design, the team made a functional product. Wat Phothaen School in Nakhon Nayok is now implementing Kenan’s philosophy and blending with the government’s initiative “Moderate Class More Knowledge”. The combination of superior classroom instruction and technology helps students master content knowledge and develop vital 21st century skills, such as critical thinking, communication, and creativity.